I know I should be writing more original entries. I’m coasting, I know. But I can’t help posting about this article. It’s about the book, Well-Read Women: Portraits of Fiction’s Most Beloved Heroines. I would love to own this book! The artwork is gorgeous as is the depiction of the women. 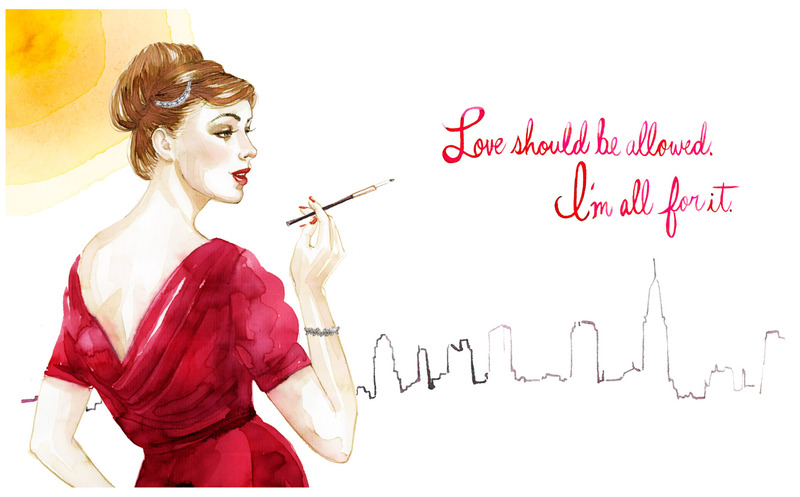 That’s Holly Golightly above from Breakfast at Tiffany’s. I love that Nancy Drew is in here, too! Wonder who else is included? See more of the artwork here. I’ll definitely be watching out for this in the bookstore when it comes out (and screw the book debt!). Is it art or is it art? Meanwhile (said in a newscaster tone of voice), over in Singapore, the “Sticker Lady” was charged in court for 15 counts of mischief. The Sticker Lady is 26-year old artist Samantha Lo, who, along with another artist Anthony Chang, were allegedly behind the “My Grandfather Road” series of street signs and stickers that were found on Maxwell and Robinson roads last year. They were also said to be responsible for putting up stickers in various parts of Singapore with captions that well, capture, the Singaporean ethos. Here’s the yahoo! link to the news story. Personally, I thought what they did was pretty ballsy considering how strict the Singaporean government is with its laws. I also thought what they did was pretty funny and thought-provoking and clever, the way art at the very least should be. Here are images from the “My Grandfather Road” series. So this has now raised a lot of questions: Is what they did art or vandalism? They were charged with the lesser offense of mischief so clearly, the government doesn’t think what they did was vandalism, but why arrest them in the first place, considering that there are a lot flyers and advertisements posted all over Singapore and the government doesn’t even blink an eye? My thinking is that it’s to make an example of them. Putting up signs and stickers like they did, after all, sort of pokes fun at the government or presents a certain way of thinking that the government maybe doesn’t want to encourage among its citizens. Here’s the question though: The government clearly wants creativity to flourish here, if we judge by the number of creative programs the government funds or encourages or invites over. But how do you nurture creativity if a little divergent thought is frowned upon? Art, after all, thrives on independent thinking and dare I say it, conflict and divergent thought. Incidentally, I may have immortalized one of Sticker Lady’s efforts. The Instagram photo above was taken last year while I was walking home from the Newton MRT station. I was going to press the button for the “walk” sign when I noticed what was written/stuck on it. I thought it was pretty clever and funny and certainly made me smile, lightening the walk home. That, for me, is a good thing. Posted on March 27, 2013 March 27, 2013 Categories Geekery, Images, SingaporeTags art, dateline Singapore, sticker, sticker lady, teleporting, yahoo!5 Comments on Is it art or is it art? Sometimes this is how I feel with my book debt — that there’s too many stories that I just let fly out the window!